I promised some time ago to dig up some photos of our farm garden to show you. Please note that these photos are the best of the thousands I have taken over the years. It doesn't always look this good! Let me take you on a little tour - it could take a few posts! We'll start at the front drive. Chinese liquidambers are planted either side of the drive, to eventually create an avenue that you will drive through. I use strawberries as a groundcover down the drive - pretty and productive! There are rows of agapanthus behind the strawberries. And yes, I planted three deodar cedars as the focal point at the end of the drive ... hmm, thinking that was a mistake. These trees can be massive! Groundcover in this photo is a 'tough as nails' cream gazania. The driveway kicks around to the left, to give a glimpse of the house. To get an idea of the perspective, this is where you are, viewed from the roof of the house! You will notice as we meander around, that given the choice between a straight line and a curve, I will almost always choose a curve! Drives my Sweetness mad!! Walk a little further around the driveway, you will come across the garden entrance. The arbour is planted with potato vine & snail vine. There is a row of standard 'Iceberg' roses to the left. The snail vine smells amazing in the summer. Unfortunately the meat ants agree with me and entering the garden can be a little hazardous at times! But it is worth braving the ants for this beauty. So here we are at the front entrance. Haven't travelled far, have we?! 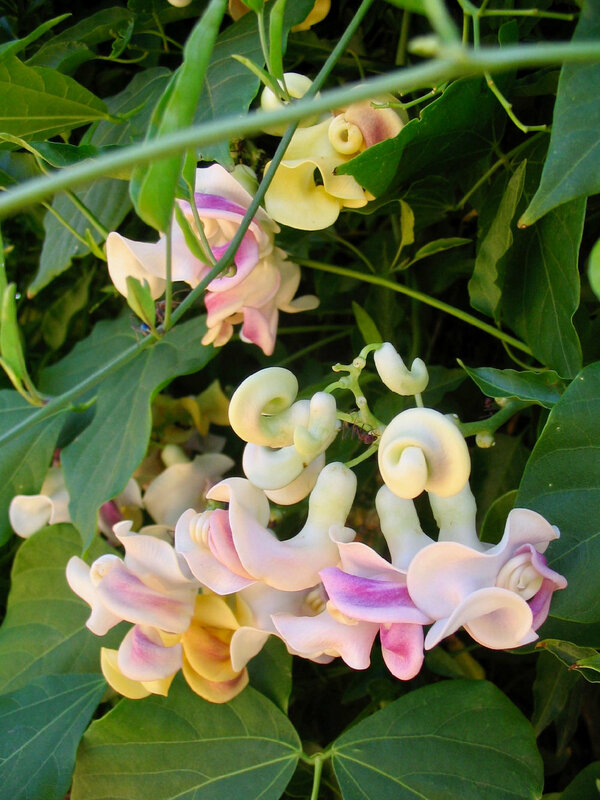 I might leave you with the heady fragrance of the snail vine for a bit, and come back later to continue the tour. Mind the ants! I could tell you, but then I'd have to shoot you!